Whether you&apos;re looking for an easy way to get your group to the ski resorts in the winter, from the airport to their hotels on arrival, or you just want some information to help them get around on a free day, our public transportation system has a lot to offer. Access most areas of the Salt Lake Valley on three color-coded lines. The Red line provides service from the University of Utah, through downtown, south to 6400 South, and then west to the Daybreak community. The Blue line begins downtown at the transfer station and runs south through the valley to Draper. The Green line begins at the Salt Lake International Airport, runs through downtown Salt Lake, and then out to West Valley City. At the airport, riders can board at the Welcome Center station just outside Terminal 1. Downtown Salt Lake provides a great transfer point, as all the lines run through downtown. One-way Trax fare is $2.50, and trains run every 15 minutes. Weekday service runs from 5:30 am to 11:30 pm, with a more limited schedule on weekends. The FrontRunner provides transportation from Ogden to Provo, with limited stops along the way. Weekday service starts as early as 4:30 am, with the laststop just after midnight. Saturday service begins at 6 am, with the laststop just after 2 am. There is no Sunday service. FrontRunner fares vary based on trip length. All FrontRunner tickets may be used as transfers on Trax or buses within 2.5 hours of purchase. 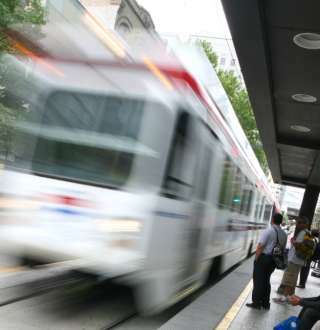 Buses provide connecting service at many of the Trax and FrontRunner stations to get you almost anywhere in the Greater Salt Lake Area. Bus routes can be found across the Salt Lake Valley, Ogden, Utah County, and up to Brigham City. There is also a connecting bus route to Park City, which has its own transit system. The ski bus operates between December and April and provides service up Big and Little Cottonwood Canyons to Alta, Brighton, Snowbird, and Solitude ski resorts. One-way bus fare is $2.50. Plan your bus trip is using UTA&apos;s trip planner or by picking up a schedule at the Salt Lake Visitors Center. UTAoffers route and transit information in a variety of languages through its interpreter program. This program is available by phone. Call 801-743-3822 (801-RIDE-UTA) or call toll-free 888-743-3822.